A decade back the process and control operations were totally implemented by using the microprocessor only. 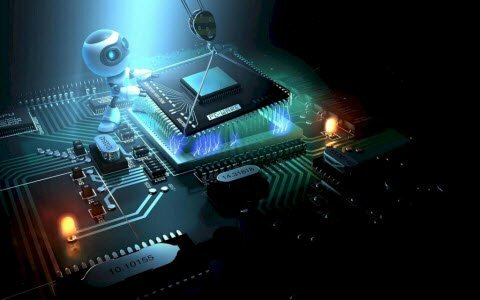 But now-a-days the situation is totally changed and it is occupied by the new device called Microcontroller. 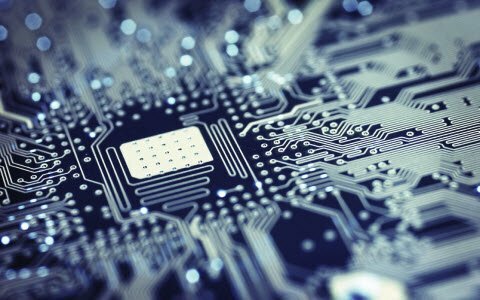 We can’t find any electronic gadget without the use of a Microcontroller because the development is so drastic. The Microcontroller has changed the embedded system design so simple and advanced. LCD’s use two sheets of polarizing material with a liquid crystal solution placed between them. When electric current passed through the crystal solution, the crystals get aligned so that light cannot pass through them. Each crystal is thus like a shutter, either allowing light to pass through or block it. There are two kinds of LCD such as color and monochrome. For projects we use monochrome, while for TV, Laptops we use color. Color LCD uses two basic techniques for producing color. 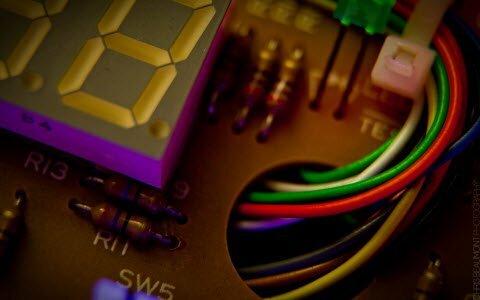 This article discusses about LCD interfacing with 8051 microcontroller. A Microcontroller is a small computer in an integrating circuit which contains memory, programmable input and output peripherals, processor core. 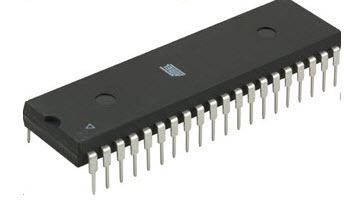 Microcontroller primarily designed for embedded applications while Microprocessor designed for personal computers or general purpose applications. 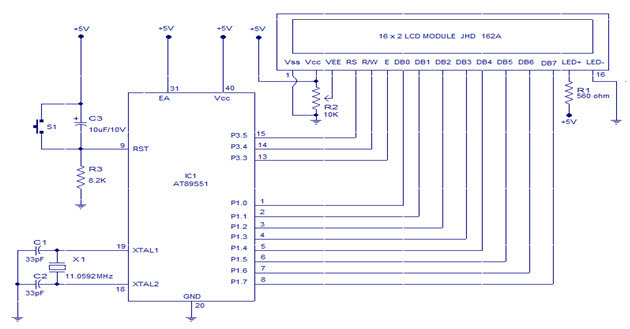 Microcontroller instructions are both bit addressable as well as byte addressable. It has instruction sets catering to the control of inputs and outputs. 16×2 LCD module is a very common type of LCD module to be used in 8051 based embedded projects. It has 16 rows and 2 columns [5×7] or [5×8] LCD dot matrices. The module we will use is number JHD162A. Available in 16 pin packages with features like contrast adjustment function, back light and each dot matrix has 5×8 dot resolution. VEE pin 3 adjusts the contrast of the LCD display by varying voltage at this pin. 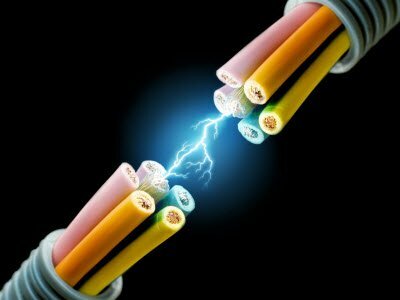 Performed by connecting one end to ground potential and other to VCC (5V). R/W pin 5 selects between read and write modes. LOGIC HIGH at pin facilitates READ mode and LOW level on this pin facilitates WRITE mode. JHD162A has 2 inbuilt registers. Logic High (1) at RS pin 4 selects the data register. Inserts a data on the data line, the module will recognize it as a command. Logic Low (0) logic at the RS pin will select the command register. E pin 6 turns on the module. A high to low transition on this pin will switch on the module. DB0 to DB7 are data pins. The data to be displayed and the command instructions are placed on these pins. LED (+) is the backlight, LED anode and this pin must be connected to Vcc through a series current limiting resistor of appropriate value. LED (-) is the backlight, LED cathode and this pin must be connected to ground. 16×2 LCD module contains set of preset command instructions. Each command will make the module to do a particular task. The commonly used function and their commands are given in the table below. 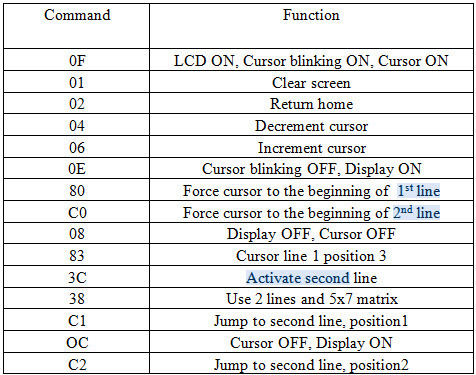 For initializing the LCD display, the following are the steps which are given below and these steps are same for almost all the applications. 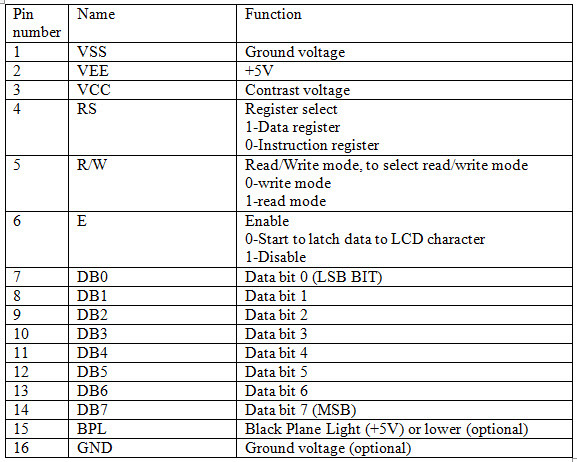 The following are the steps for sending the data the LCD module which is given below. The logic state of these pins that make the module to determine whether a given data input is a data or command to be displayed. RS=0, if data byte is a command. The circuit diagram of Interfacing 16×2 LCD module with AT89S51 Microcontroller is as shown above. Resistor R3, Capacitor C3 and push button switch S1 will form the reset circuitry. Crystal X1 and ceramic capacitors C1, C2 is related to the clock circuitry which will produce the system clock frequency. P1.0 to P1.7 pins of the microcontroller is connected to the module DB0 to DB7 pins respectively, this route the data which go to the LCD module. P3.3, P3.3 and P3.5 connect to the E, R/W, RS pins of microcontroller and this route the control signals which are transferred to the LCD module. 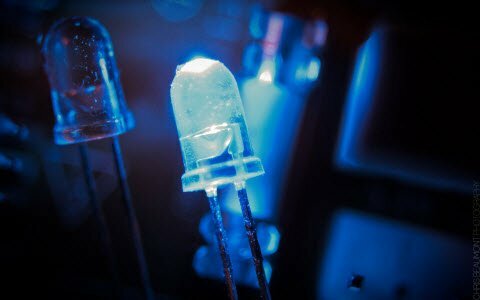 R1 resistor limits the current through the LED backlight and the backlight intensity. POT R2 is used for adjusting the contrast of the display. 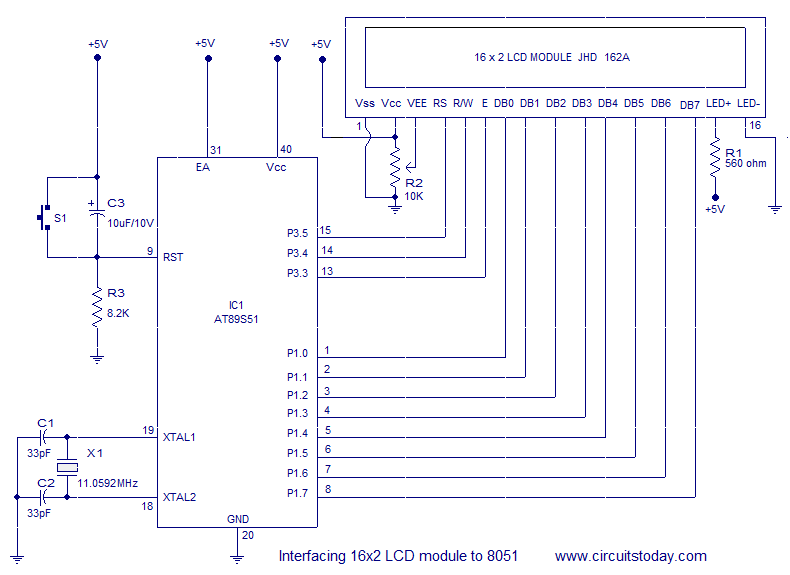 The program for interfacing LCD with 8051 microcontroller is as shown below. This is all about LCD interfacing with 8051 microcontroller. We believe that the information given in this article is helpful for you for better understanding of this project. 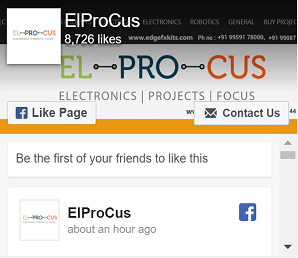 Furthermore, any queries regarding this article or any help in implementing the electrical and electronics projects, you can feel free to approach us by connecting in the comment section below. Here is a question for you, what is the code for LCD interfacing with 8051 microcontroller?